One of the unique features of Arabic morphology is its underlying character of tying form to function. Being true to its nature as a plain and straightforward language, Arabic verbs can be easily categorized and grouped together, by paying attention to its form and pattern. This pattern will, in turn, assist the leaner in grasping the general meaning of the verb. Tying form to function - that is what الأوزان الصرفية are all about! Once the form, or pattern, of a group of words has been recognized by a foreign learner of Arabic, they will begin to grasp the meaning that is represented by that form and understand the meaning of that pattern which is common to all words that share that same pattern. The lessons and exercises which have been designed for this entry-level module introduce students to the meanings of certain words, especially VERBS, through form recognition. This course is geared towards students who have been studying Arabic and are looking for a refresher course to revive their linguistic skills. This 'skills builder' course is suitable for learners of Arabic who have covered basic sentence structures & simple everyday vocabulary. 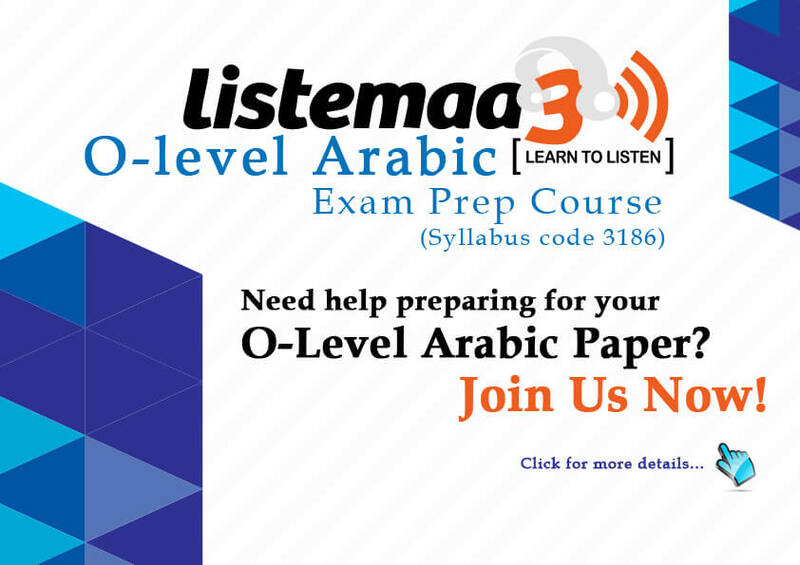 Later lessons in this course focus on practical skills that will be extremely useful for learners who intend to sit for their O Levels Arabic Exam this year (2015). This course is best viewed on a desktop, laptop or tablet computer. Each week a new lesson will be uploaded to this course. Lessons will focus on translation practice with special emphasis on vocabulary usage and sentence structure. Listemaa3 © 2014 - 2018. All Rights Reserved.